Introducing RoundTail (R), a revolutionary custom made bicycle frame that dramatically increases comfort. 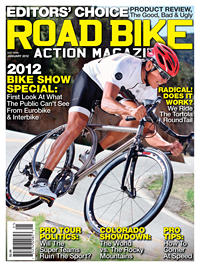 (Windsor, Ontario) – RoundTail CEO and Inventor Lou Tortola is thrilled to announce the Titanium RoundTail was featured on the cover of Road Bike Action Magazine (roadbikeaction.com). Road Bike Action is a well-respected consumer publication featuring the latest in cycling news, product reviews, road bike tests & features, race news and much more. Says Tortola, "It gives me a great sense of pride and accomplishment to have it so fortuitously featured on the cover of Road Bike Action nearly one year to the day after the idea's inception." "The Tortola RoundTail may not look like any other bike on the road, but it still exhibited all the handling and ride quality characteristics of the best titanium frames around," was Road Bike Action's pronouncement after putting the RoundTail through its paces for a two-week period. In addition to the cover, Road Bike Action devotes a full four inside pages to coverage of the RoundTail, with a story written by editor Zapata Espinoza (aka "Zap") himself and stunning images captured by photographer John Ker of both the bike and the rider, John Umale. Zap was inducted into the Mountain Bike Hall of Fame in 1995. From 1986-1993, he was editor of Mountain Bike Action Magazine which, under his leadership, became the largest mountain bike publication in the industry. Zap is one of the most visible and colourful figures in mountain bike journalism and his passion and commitment are evident in his outstanding work. He is also a strong supporter of racing and works to promote cycling safety, advocacy and product merchandising through his insightful journalism. Zap's Road Bike Action blog can be found at http://roadbikeaction.com/Zap/articleindex/75/Zap.html. John Ker is a 2010 inductee into the Mountain Bike Hall of Fame for his legendary photographic work for Mountain Bike Action Magazine. Jim McIlvain, the editor of Mountain Bike Action, wrote: "John has turned three generations of riders onto our sport with photos that capture the spirit, excitement and thrills of mountain biking...John is truly one of the unsung heroes who has had a far greater impact on mountain biking than can be measured." Over the last 20 years, John has photographed nearly every major star in the sport across the U.S., Canada, Europe and Australia. As McIlvain further says, "It would be hard to imagine a rider in the Hall of Fame whom John hasn't shot (and become friends with)." The RoundTail's groundbreaking design prompted Mountain Bike Action Magazine in April to ask, "Will every hardtail mountain bike be a RoundTail by 2015?" Popular Science Magazine, also stated, "Bikers had no pain after riding for 50 miles on the RoundTail, while they ached on other frames after only two." (Windsor, Ontario) – RoundTail is excited to announce its very first appearance at the Interbike International Bicycle Expo in Las Vegas, Nevada, next week, from September 14th through 16th at Booth 28077. After the success of the RoundTail launch in April at the San Diego Custom Bicycle Show, CEO and Inventor Lou Tortola says he's looking forward to introducing his new models to an even wider audience. "Interbike will be a great opportunity to showcase the revolutionary design and beauty of the RoundTail models as well as the physical benefits and enhanced experience cyclists will enjoy when they ride the RoundTail." Tortola created the RoundTail by substituting a pair of rings for the rear triangle of a traditional frame. Independent testing shows the RoundTail is 10 times more vertically compliant and absorbs 60 times more road vibration than a standard bike frame, reducing the stress and fatigue on a rider's body. This groundbreaking design prompted Mountain Bike Action Magazine to ask, "Will every hardtail mountain bike be a RoundTail by 2015?" Tortola will be showcasing four new RoundTail models at Interbike: the Delia, a new RoundTail hybrid; the San Massimo, a RoundTail 26" Mountain Bike; the Campitello, the first-ever RoundTail 29er; and the striking RoundTail Amantea, a titanium Road Bike model built by Lynskey Performance. Spurred on by response to the RoundTail feature in the September 2011 issue of Popular Science Magazine and features in other publications such as Mountain Bike Action Magazine, BikeBiz, Canadian Cycling Magazine, and Road Bike Action Magazine, Tortola says, "We've been thrilled with the overwhelming public interest in our bikes. We hope the many visitors and dealers in Las Vegas will be just as excited." © Tortola International Inc. All Rights Reserved.